2016 ARC AUGUST • Another one! You read how many ARCS you want. YOU get to decide. The book must be an ARC—physical or electronic. The ARC can be old or new ones. As long as it’s an arc, it’s okay. You have until July 31st to sign up! I urge you to, especially if you have ARCs you need to read! Also, there’s a lot of wonderful readers joining in. ARC AUGUST, HERE WE GO AGAIN. My pile for this ARC August is lesser than the previous times, and that’s because I have finished review copies I gotta get through as well. It’s lookin’ to be a full month of reading, and let’s hope I get back on that reading horse! There might be add-ons depending on how fast I get through this pile, but these six ARCs are my main priority for ARC August. 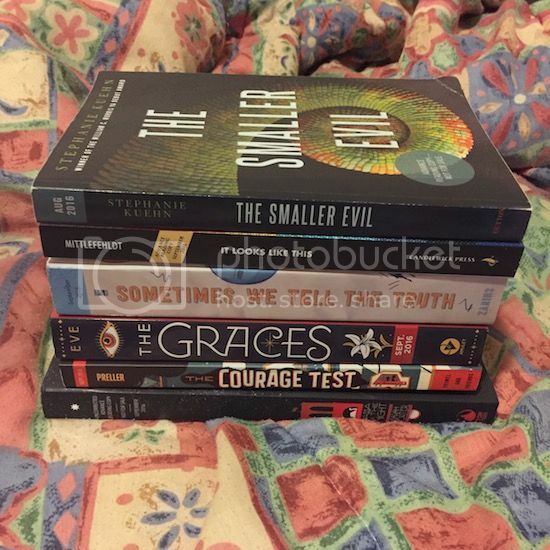 Have you read any books from my ARC August pile? Are you looking forward to any of them? Ahh you have so many awesome books to read! I really want to read Sometimes We Tell the Truth, The Graces, Sometimes We Tell the Truth and Vassa in the Night! ENJOY! Yay ARC August! I’ve actually got Vassa and The Graces on my ARC TBR as well, so here’s to hoping we both manage to read them this month AND enjoy them!